Please choose your target-group from the sub menue! Storing in 11 colours (1,2-1,4 mm). Soft half-bovine leather with pebble grain. Especially for sport, work and leisure time shoes. high abration. The lower price-variant for the orthopaedic shoe. water-repellent, solid-coloured, with a fine silk-gloss. Perfect for the elegant version of an orthopaedic shoe. suitable for sensitive feet and diabetics. Storing in 23 colours (1,0-1,2 mm). Fine sharpened Velours Split, water-repellent and solid-coloured, suitable for colour-combinations with Ortho-Soft. Perfect for the hard-wearing shoe. Storing in 2 colours (1,3-1,5 mm and 1,8-2,0 mm). Therefore WR 100 Superproof is the ideal leather for orthopaedic (worker) shoes. Storing in 4 colours (1,8-2,0 mm). Storing in black, wine-red, dark brown (2,2 – 2,4 mm). Perfect for the hard-wearing shoe with metal-hood. Storing in black (1,6-1,8 mm). hard-wearing men’s shoe as well as for an easier worker shoe. Produced from the tannery Horween from Chicago. Storing in 5 colours (1,6-1,8mm). Embossed cattle halves, particularly suitable for sporting-elegant hand-made shoes. The leather is combination tanned and aniline finished. Storing in 7 colours (1,1-1,3 mm). suitable for sporting-elegant hand-made shoes. Storing in 10 colours (0,9-1,1 mm). Braided, shining Calfskin available in 60 cm of breadth. Ideal for combinations for example with Box Calf. An optimal leather or for the summer shoe completely out of braided leather. Storing in colour “nature” (2,3-2,5 mm). Climbing boots, endeavour shoes and suitable for the agricultural area. Storing in 10 colours (1,3-1,5 mm). Full scarred Anilincalf with a special high gloss. The most elegant leather, that you can offer your demanding customers. Tanned, not finished boxcalf, ready for coloration. Storing 1,2-1,4 mm strengths. Available in 8 colours. The special treat for the elegant hand-made shoe. Therefore WR 100 Superproof is the ideal leather for golf- and outdoor-shoes. Storing in 7 colours (1,4 – 1,6mm). From the reverse side finished hunting calf. Particularly suitable for the elegant hand-made shoe. We have 7 colours in stock. Smooth skin suitable for the extravagant hand-made shoe. Sizes are available in 32-35cm. Smooth skin with a fine polish suitable for the extravagant hand-made shoe. Sizes are available in 32-35cm. Storing 0,7-0,9 mm, 1,0-1,2 mm and 1,2-1,4 mm strengths. Very soft chrome-tanned lining leather, particularly suitable for sensitive feet. Storing 0,8 – 0,9 mm and 1,2 – 1,4 mm strengths. Chrome-tanned lining leather with a little more solid handle. Chrome-tanned, not through-perforated calf lining leather, special for footbeds and insoles. Combined-tanned, solid and very smooth surface with a very light silky shine. Combined-tanned, perforated (not through perforated), solid and very smooth surface with a very light silky shine. Special for footbeds and insoles. Storing 0,6 – 0,7 mm strength. Chrome-tanned, very soft, lightly coloured. Particulary suitable for fine ladies’ shoes. Storing in the colour beige, very smooth on the skin, close-cropped. 125 years at the company Rendenbach sole leather has been produced. Refining process makes the production of those high-quality natural products possible. orthopaedics- sector all over the world. will be the main challange for the company now in the fourth generation represent! Old tanner necks for insoles and caps. Stamped heel stiffeners, sharpened and cut in three sizes. Croupon for the quality-conscious repair. Storing in 3,0-4,0 mm, 4,0-5,0 mm and 5,0-6,0 mm. and awards the leather uppers a silky brilliance. For the exact measure of a footprint. Leather frame in different colours and kinds, sample on inquiry. 1,5-1,7 mm, 1,7-1,9 mm and 2,0-2,2 mm strenghts. Special for the solid insole producing. Vegetably-tanned calf leather, more solid leather, very sweat-resistant. The higher qualaty insole variation. Chrome-tanned calfskin, which is characterized by his smoothy grip. Suitable for very sensible feet for insoles. for the sporty-elegant model insole. stretchability, suitable for linings for prostheses. very hard-wearing, suitable for lining of belts, prostheses and corsages. of hand and foot prostheses. 0,7-0,9 mm strength, suitable for covering and lining of prostheses. particularly suitable for the soft inlining of prostheses. Combined-tanned pig split for the cover of the back side of insoles. Chrome-tanned calf split for the cover of the back side of insoles. safety seats, buggys, wheelchairs and so on…. buggys, wheelchairs and so on…. 2.0 mm, 2.5 mm, 3.0 mm and 3.5 mm. Chrome-tanned belt leather in the strengths 2.5 mm and 3.0 mm. Storing 0,6-0,8 mm strength, suitable for the covering of prostheses. Insoles cover material. Insoles cover material. For the exact measure of a footprint.For the exact measure of a footprint. On inquiry we like to send you quality- and colour- patterns. Storing in a lot of colours and different qualities. Minimum purchasing quantity: one piece for all kind of leather except for cattle. Every product covered in leather is unique in its kind. The natural characteristics of furniture leather and the pleasant touch lend themselves perfectly to armchairs, couches and chairs, adding a touch of elegance and class to the furniture. Daily care of the leather is not difficult and needs only a bit of attention. All the leathers have already been treated for dust resistance. Don’t ever use chemical products or specific cleaning products currently in the market, as they can adversely affect the characteristics of the leather. Ensure that your sofa is positioned at least 50cm away from heat sources such as fireplaces, stoves and heaters. Do not expose leather to direct sun light or other strong light sources, as these may cause colors to change. Dust periodically with a wool cloth. Air the environment on humid days. circular motion over the mark/stain without using any pressure and dry carefully with a wool cloth. 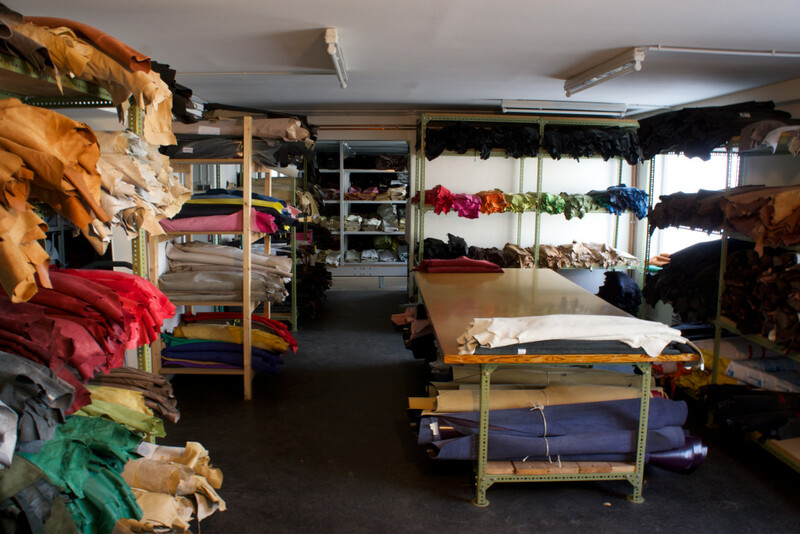 Storing a big assortment of several kinds of insole- and heel- leathers. Approx. 20.000 sqm leather from Calf, Cow, Goat and Lamp by famous designers at a price of EUR. 26.00/sqm on stock. DATENSCHUTZ | IMPRESSUM | MPG/MPL | web by plank.